During the holiday season, consumers are bombarded with an assortment of holiday-themed advertisements, making the landscape both crowded and repetitive. As more brands adopt omnichannel into the framework of their holiday campaign, marketers need to be both clever and strategic if they’re to gain any traction during the holidays. If there was ever a time for brands to pay attention to digital strategy in regards to the holidays – it’s now. It may still be summer, but behind the scenes, holiday marketing planning is in full-swing. Consumers are starting their holiday shopping earlier each year. In fact, 1 in 5 customers begin their holiday shopping in September. As the modern consumer searches for deals across devices and platforms, brands are presented with an ideal opportunity to grab their attention and influence their purchase decisions. The reality of today’s marketplace is that a growing number of consumers use their mobile devices to find stores, compare prices, and make purchases despite only seeing a product as a virtual image online. The holidays are no exception. For the 2014 holiday season, mobile traffic accounted for 45% of all online traffic and additional data suggests that between Thanksgiving and Cyber Monday, traffic from mobile devices contributed to 26% of eCommerce sales. To put that into perspective, that’s approximately 1 trillion dollars of all retail sales influenced by shopping-related mobile searches. Plan to increase your mobile ad spend during key days during the holiday season, specifically during the Thanksgiving to Cyber Monday traffic spike. If your mobile experience is lackluster, entice mobile users to visit your store or retail partners. Consider increasing mobile spend in targeted geographic areas where your customers are likely to visit your retail store and assist their shopping behavior. Explore the latest mobile ad formats that are available through AdWords and Facebook to reach new audiences and keep your brand top-of-mind in those micro-moments. In this year alone, Twitter began autoplaying videos in their feed, YouTube began supporting 360-degree video uploads, and live-streaming platforms like Periscope and Meerkat took off. Video is taking content marketing by storm and is taking off amongst online audiences. In fact, between 2012 and 2014, smartphone and tablet video consumption grew 400%. More recent data suggests that mobile video views have jumped 100% in Q1 of 2015. The benefit of video lies in the fact that it is a highly shareable, highly engageable content that can be integrated across all digital channels. From YouTube to Facebook to Twitter to micro-video platforms like Vine, brands that are able to adopt video as a viable means for advertising are already a step ahead of the competition. Producing high quality videos takes time, so if you haven’t already started, there's no time like the present! Invest in video advertising to increase brand awareness and share your brand story. YouTube TrueView videos are a great way to increase brand awareness and only pay for when a user watches at least 30 seconds or completes the video (if they don’t reach this - free brand impressions). Make sure your video captures your customers interest in the first 3-5 seconds to improve view rates. If there’s one thing we can count on this holiday season, it’s that customers will be flooded with emails, social, and retargeting ads from their myriad of brand connections. Personalization places the brand-to-consumer relationship front and center with a tailored message based on their individual preferences. A recent study showed that 70% of consumers expect some level of personalization from the brands they engage with. Savvy marketers will leverage this unique opportunity to connect with audiences on a personal level this shopping season through channels that span across email, social media, video, and retargeting. Your customers aren’t all the same - create personalized experiences based on audience segments. Don’t forget about your customers from the 2014 holiday season - reconnect with those who purchased during the previous holiday season. Pay special attention to new potential customers that have recently visited your website - they’re likely browsing for holiday gifts. The more data that you can incorporate into your marketing strategies, the more relevant your holiday marketing will be. We’ll stake the claim again: email marketing is alive and well. It’s a solid way for brands to support their holiday campaigns and reach existing customers who have already expressed an interest in their business. In fact, we found that email marketing accounted for 27% of eCommerce sales on Black Friday of last year. Ensure you have an email list growth strategy in place now, so you are able to reach more customers when your holiday email campaigns begin to launch. Plan your email marketing strategy now - promotional holiday emails will begin to flood customers inboxes, so make sure yours are timely and stand out. If it isn’t already, upgrading your email template to be mobile optimized will help boost email click-through rate. Integrate some level of personalization - consumers are more likely to open emails and take action. As social media continues to dominate the mobile space, it shouldn’t come as a surprise to see social commerce growing. Twitter and Pinterest have launched “buy buttons”, allowing users to simply purchase items with just a few clicks. Facebook advertising has been a dominant social commerce source for years, and Instagram is starting to follow in Facebook’s footsteps. 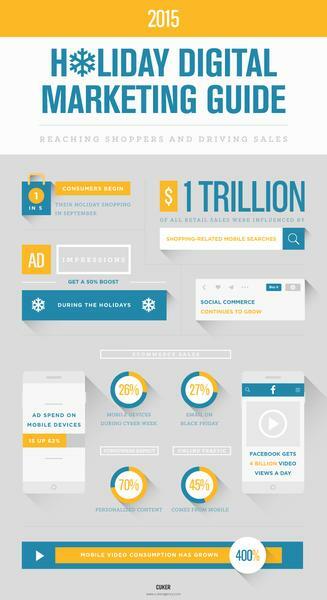 This holiday season, you can expect to see more targeted social ads across all social channels. Use social advertising to stand out among all the other brands that are posting holiday related social content. Consider running a social activation pre-holiday season to grow your email list. Ensure that your social ads are quality content, relevant, and highly targeted to receive the best response. Get in the spirit of the holidays - create holiday related images to post on your social channels that don’t just focus on sales, but rather a fun holiday visual. Paid search can be one of the most important actions to take to raise awareness and drive sales for eCommerce retailers. During the holidays, ad impressions get a 50% boost and conversion rates increase 60%. Brands should take this increase in traffic into account when determining their paid search budget for the holidays. Across all channels, organic search is the largest driver of traffic for businesses. Holiday content may have a limited shelf-life, but consumers are undoubtedly making holiday-related shopping searches. Content such as holiday gift guides not only expose your brand and product to interested consumers, they can improve eCommerce sales dramatically. A holiday retargeting strategy is a great way to keep your brand top-of-mind to online shoppers. Make sure to budget your ad spend appropriately during October and November. Online shoppers start early in the month and make final purchasing decisions during Cyber week once sales are out. Be aware of when your customers converted last year and optimize campaigns to leverage peak shopping periods (day of week, time of day, etc.). We’re just a few months away until we’re knee deep into the busy shopping season, so now is the time for brands to set up their holiday plans for success. Published on September 21, 2015 .